My good friend Hilariter, who must by now be near to finishing his Doctorate on St Hilary of Poitiers, doesn't update his blog very often but when he does, it is worth reading. Yesterday he had a fascinating account of a trip to Anagni. Although the museum was "in restauro" (closed for restoration) - an expression with which you become wearily familiar in Italy, the intrepid Father managed to get in, courtesy of a couple of priests who were around. They got to see the mitre of St Thomas Becket and other relics. The frescoes depicting the death of the martyr Bishop St Magnus owe much to the story of St Thomas Becket. As in all good Italian gite, the day included lunch at a "good but cheap trattoria" - that is one of the great blessings of life in Italy. You can have a large bowl of pasta, fresh local bread, and a carafe of local wine for about as much as you would pay for a sandwich and a "smoothie" in London. In another tradition of such days out, there had to be some attempt at re-enactment. Hilariter got to play the part of Pope Boniface VIII in the incident of the Schiaffo D'Anagni (Anagni's Slap) when Sciarra Colonna slapped the Holy Father. This was after the promulgation of the bull Unam Sanctam when Pope Boniface proclaimed not only that there is no salvation outside the Church but that the Church held the power of the two swords, spiritual and temporal. 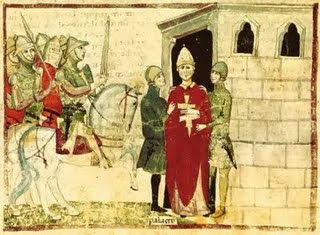 In a resulting revolt, the Pope was captured at Anagni, put in prison, and given the celebrated slap. To their eternal credit, the citizens of Anagni rose up and released the Holy Father but sadly he died a year later.